On March 17, 2016, Electrolife was present during the Press Day of The Media Nanny as part of the "Miami Music Week”. Having exclusive interviews with DJs and promoters of the scene. 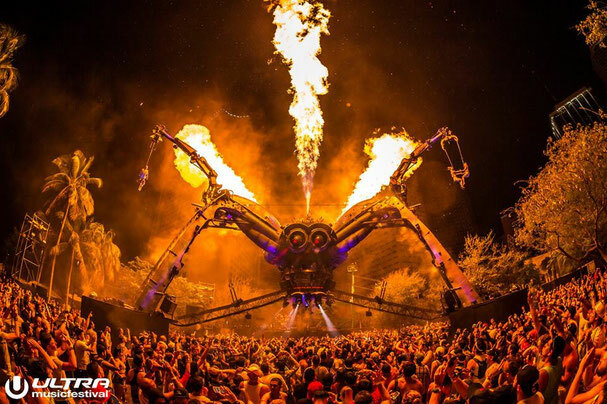 We had the opportunity to sit down with the creators of Ultra Music Festival’s most immersive stage; the "Arcadia Spider" which undoubtedly was one of the highlights of the festival throughout the weekend. Electro Life: What do you think of Miami Music Week so far? Arcadia: We are really excited to be here, we spent a lot of time planning this show. We came last year and we had a really great time, so we are extremely excited to be back here. Electro Life: So you enjoy all the parties, the social media and of course all the atmosphere that goes along on this week? Arcadia: Yes, it’s a great experience, in the Miami sunshine everything is better. Electro Life: As you know, the most important part of this week is what comes in the end of it, and that is Ultra Music Festival. 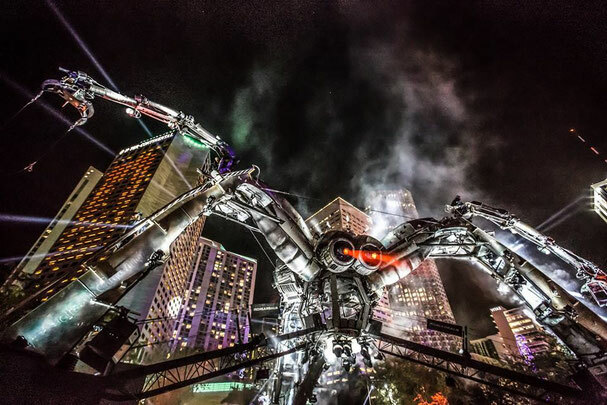 This year Ultra will be presenting a Brand new stage called “Arcadia Spider”, what can you tell us about it? Arcadia: First of all, its not a stage, its a sculpture and it works with a lot of disciplines. It doesn't only showcase music, the sculpture moves. It has mechanical arms that support the acrobatics and there’s tons of special effects including fireballs, lasers and CO2 cannons. We have a special daily show which is called the “Landing Show” in which everything really comes to life and then apart from that there’s a continuous freestyle show by our production which is in sync with the dj’s performing. Electro Life: So basically it’s not only about the music but also about the whole experience that the Spider can give to the fans? Arcadia: Yeah, it is about the sounds, the sights, people, the energy, it all comes together. Electro Life: As we all know this stage comes from Glastonbury in England, so is this the first time this kind of stage comes to America? Arcadia: Yes, its our first presentation in America with the Spider and its our biggest one with the sculpture. Last year we brought the “Afterburner”, which was a much smaller stage. This year we obviously chose to do things bigger for Ultra. Electro Life: And why do you choose Ultra and instead of other festival? Arcadia: Because we are really happy to be part of the Resistance team. They are pioneers in showcasing underground music and we feel like the combination of our stagedesign and their musical input is a very good one. Everything that we’ve learned and over the years comes together with this stage at Ultra and we’re very proud of that. Electro Life: Everybody knows that Ultra is a worldwide festival, can we expect seeing the Spider at another Ultra ? 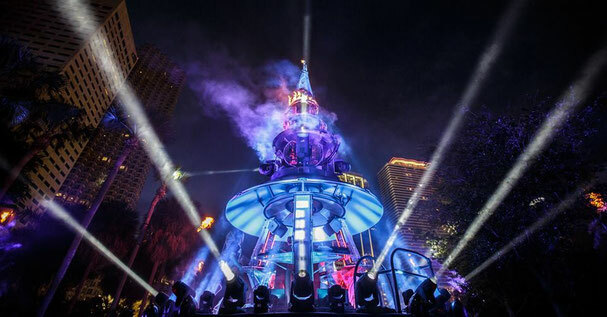 Arcadia: Actually, our “Afterburner” stage was at Ultra Europe last year and we just planned three shows for “The Spider” at Ultra with this being the first one. We still have two more shows to go after this so we really hope that this comes along nicely with the fans. Electro Life: So maybe will see “The Spider” at Ultra Europe and Ultra Japan later this year? Arcadia: Yeah, those shows are part of the Resistance and we are hoping to send them to the other festivals. Electro Life: Ok now talking about the Arcadia Spider, what makes it so unique? I mean we know that “The Spider” is made by recyclable materials. Arcadia: Yes and thats the great part of the sculpture because we can go to the scrapyard and acquire some more material for the sculpture. Recycling is a big part of the concept and we feel very lucky to be able to redefine so many objects to benefit our sculpture. Actually the Spider’s eyes are made of jet engines, the DJ booth is made from a jet turbine and the legs of the Spider are made out of scanning equipment that was used by the government before this. Electro Life: Wow, thats fascinating. Arcadia: It all weighs in at around 50 tons. And when it’s properly incorporated in the environment it really helps creating an atmosphere at the event. Electro Life: Yeah, and of course the fun part is that you present an awesome show with all these recyclable material and yet you are having fun. Electro Life: So, what are you waiting to achieve at the end of this week? I mean what are your expectations for Ultra Music Festival? Arcadia: We’ve obviously seen quite some crowds already all over the world but we’re just very curious to see how this stage is going to be welcomed by the Ultra Miami crowd. We want it to become a special thing at the festival and not just any old stage. Thank you guys so much for this super interesting chat and hope to see you somewhere soon!